Enough Is Enough, Extend The Police Training Duration! It is quite normal to get a 'Judas' out of every twelve, but it becomes very alarming when 6 or more 'Judases' emerge from every twelve. Such is becoming of the situation in the Ghana Police Service whose name was changed from Gold Coast Police Force with the hope that the use of force which characterized the Police would be substituted with service with integrity in line with their motto. 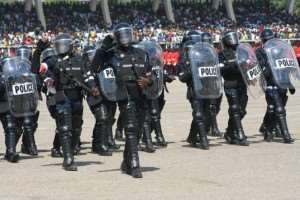 The Ghana Police have headlined the news portals and airwaves for unenviable reasons; assaulting suspects during arrests, firing of arms during demonstrations into crowds (AFAG demonstration resulting in the lost of an eye of a protester and the recent Ayawaso election), extortion of money from drivers and a myriad of misbehaviours which would exhaust pages. It is so irking and hearts wrenching that in the above instances, the police seem to cover up their own and hound the civilians. What happened to Mr. Ammanor, the police who sadistically assaulted a nursing mother and a customer of Midland Savings and Loans Limited? The Director-General of Public Affairs of the Ghana Police Service, ACP David Eklu, has confirmed on Citi FM that "internal disciplinary processes" are still ongoing after the July 2018 heartless assault and that any aggrieved individual can head to court, meanwhile, the police administration has reinstated Mr. Ammanor back to duty. Doesn't the ACP know that many institutions like the Ghana Education Service have same internal disciplinary structures which can deal with teachers who violate the law, yet his men gleefully and with alacrity arrest and prosecute them? What has happened to the two policemen who shot and killed the driver of a GCB bullion van at Donkorkrom in a robbery operation? The driver and his mate who assaulted a policeman at Weija last week have been charged and remanded to reappear on April 04. Reliable information has it that they have been atrociously brutalised by the police and preventing any visitor from visiting them. On a sharp contrast, nothing has been heard of the three policemen who physically assaulted an Uber driver and slapped an inquisitive lady at Sowutuom in December 2018 because of their omnipotence and infallibility. It was not for fun that the Inspector General of Police, David Asante Appeatu, proposed that a first degree should be a prerequisite for recruitment into the Ghana Police Service because he may have observed that strong men are preferred to strong minds in the recruitment process. While the strong men police think policing is all about the use of strength, the strong-minded police believe that the brain should be used more in the discharge of their duties. The Minister of the Interior should review the duration of training of police in Ghana because six months of training is woefully inadequate to train strong-minded police personnel. Police recruits should be made to go through rigorous academic work especially in law and work ethics and write and pass examinations in not less than 40 credits. This would help flush out substandard policemen especially those who are unable to put together simple English to write statements or express themselves orally making them figures of public ridicule. Enough is enough. In order not to put the security of our dear nation into jeopardy, the duration of training of the Ghanaian police should be extended because in basic economics, the efficiency of labour is largely influenced by the duration of training.